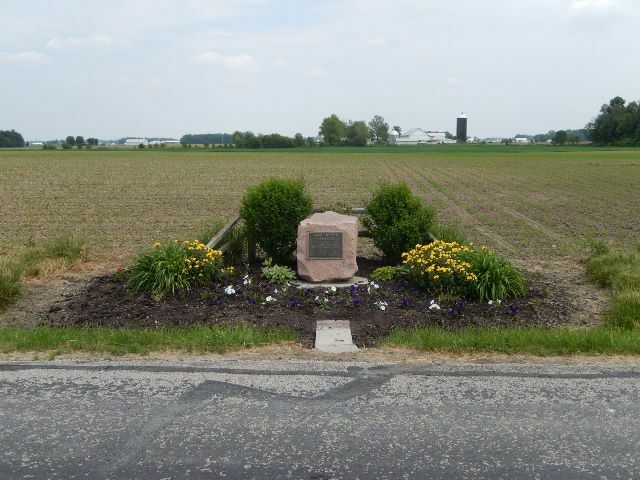 Oakley was born in a cabin about 2 miles (3.2 km) northwest of Woodland, now Willowdell, in Darke County, Ohio, a rural western border county at the time. 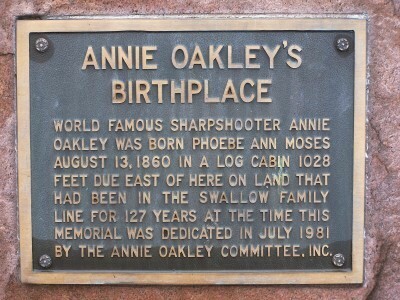 There is a stone-mounted plaque in the vicinity of the cabin site, which was placed by the Annie Oakley Committee in 1981. Annie’s father, who had fought in the War of 1812, became an invalid from overexposure during a blizzard in late 1865 and died of pneumonia in early 1866 at age 66. Following the death of her father, Oakley did not regularly attend school as a young child because of lack of funds, but she did attend later in childhood and in adulthood. On March 15, 1870, at age 9, Oakley was admitted to the Darke County Infirmary, along with elder sister Sarah Ellen. According to her autobiography, she was put in the care of the infirmary’s superintendent, Samuel Crawford Edington, and his wife Nancy, who taught her to sew and decorate. Beginning in the spring of 1870, she was “bound out” to a local family to help care for their infant son, on the false promise of 50 cents a week and an education. The couple had originally wanted someone who could pump water, cook, and who was bigger. She spent about two years in near-slavery to them where she endured mental and physical abuse. One time, the wife put Annie out in the freezing cold, without shoes, as a punishment because she had fallen asleep over some darning. Oakley referred to them as “the wolves” and even in her autobiography, she never revealed the couple’s real name (reputedly out of kindness despite their treatment of her). Around the spring of 1872, Annie ran away from “the wolves.” According to biographer Shirl Kasper, it was only at this point that Annie had met and lived with the Edingtons, returning to her mother’s home around the age of 15, by which time her mother had remarried (for a second time, having been twice widowed). Oakley began trapping before the age of 7, and shooting and hunting by age 8, to support her siblings and her widowed mother. She sold the hunted game to locals in Greenville, such as shopkeepers Charles and G. Anthony Katzenberger, who shipped it to hotels in Cincinnati and other cities. She also sold the game herself to restaurants and hotels in northern Ohio. Her shooting prowess earned her enough money that she was able to pay off the mortgage on her mother’s farm by the time she was 15. Oakley’s skill was well known throughout the region where she lived. According to the conventional account, on Thanksgiving Day 1875, the Baughman & Butler shooting act was booked in Cincinnati. Traveling show marksman and former dog trainer Frank E. Butler (1847–1926), an Irish immigrant, placed a $100 bet (worth $2,181 today) with Cincinnati hotel owner Jack Frost that Butler could beat any local “fancy shooter.” Frost arranged a shooting match between Butler and the 15-year-old Oakley, saying, “The last opponent Butler expected was a five-foot-tall 15-year-old girl named Annie.” The actual details of the match, as well as the dates, are sketchy at best. The general story is that Butler missed on his 25th shot and Oakley won. 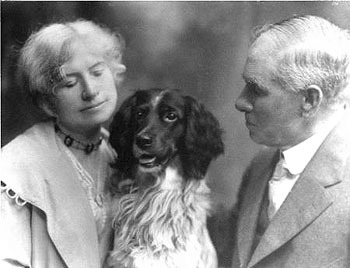 Subsequently, Butler who was 28 and married at the time, courted Oakley and married her a year later after he divorced his wife. I don’t see any reason to doubt that a 16-year-old Oakley would marry a man 13 years her senior, but many historians have expressed some incredulity. You need to consider that this was the 19th century and Oakley had already lived a tough frontier life before she met Butler. There are other possibilities, however. Many modern accounts put the shooting match in 1881, not 1875. The Annie Oakley Center Foundation mentions Oakley visiting her married sister, Lydia Stein, at her home near Cincinnati in 1875. That information is incorrect as Lydia didn’t marry Joseph C. Stein until March 19, 1877. It is likely that Oakley and her mother visited Lydia in 1881 as she was seriously ill from tuberculosis. The Bevis House hotel (where the shooting match supposedly took place) was still being operated by Martin Bevis and W. H. Ridenour in 1875. Jack Frost didn’t obtain management of the hotel until 1879. The Baughman & Butler shooting act first appeared on the pages of The Cincinnati Enquirer in 1880. 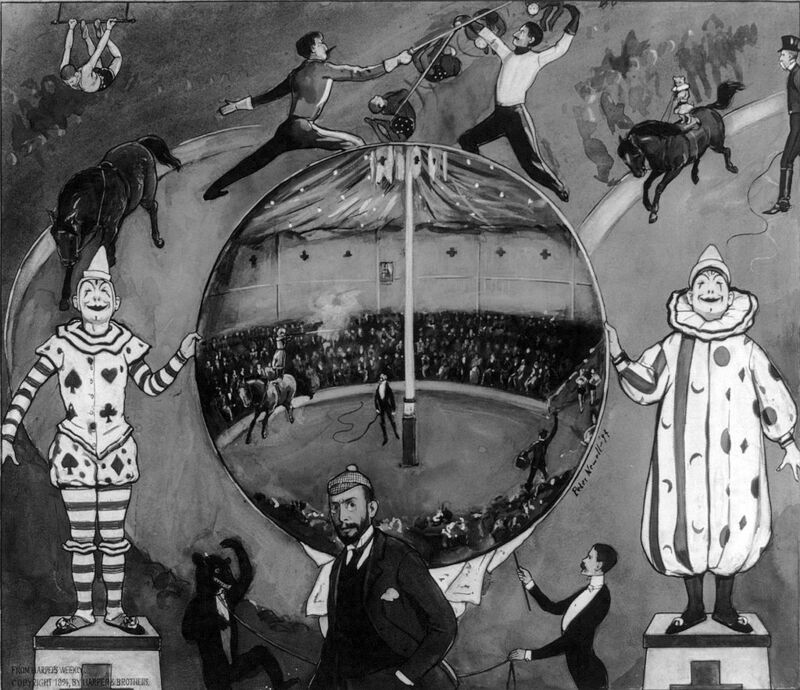 They signed with Sells Brothers Circus in 1881 and made an appearance at the Coliseum Opera House later that year. Oakley and Butler were married a year after the shooting match and there is a certificate currently on file with the Archives of Ontario, Registration Number 49594, reporting Butler and Oakley being wed on June 20, 1882, in Windsor, Ontario. Other sources say that the marriage took place on August 23, 1876, in Cincinnati, but there is no recorded certificate to validate that date and place. Throughout Oakley’s show-business career, the public was often led to believe that she was five to six years younger than her actual age. Claiming the later marriage date would therefore have better supported her fictional age. Confused yet? I’d say that the smart money is on the shooting match taking place when Oakley was 21 and she married Butler when she was 22 in Ontario. Her show publicity shaved 5 or 6 years off her life, saying she was 15 when the match took place, not 21. Some contemporaries knowing her actual year of birth (1860) did the arithmetic and pegged the date of the match (erroneously) at 1875, and it stuck. Annie and Frank lived in Cincinnati for a time. Oakley, the stage name she adopted when she and Frank began performing together, is believed to have been taken from the city’s neighborhood of Oakley, where they resided. They joined Buffalo Bill’s Wild West in 1885. 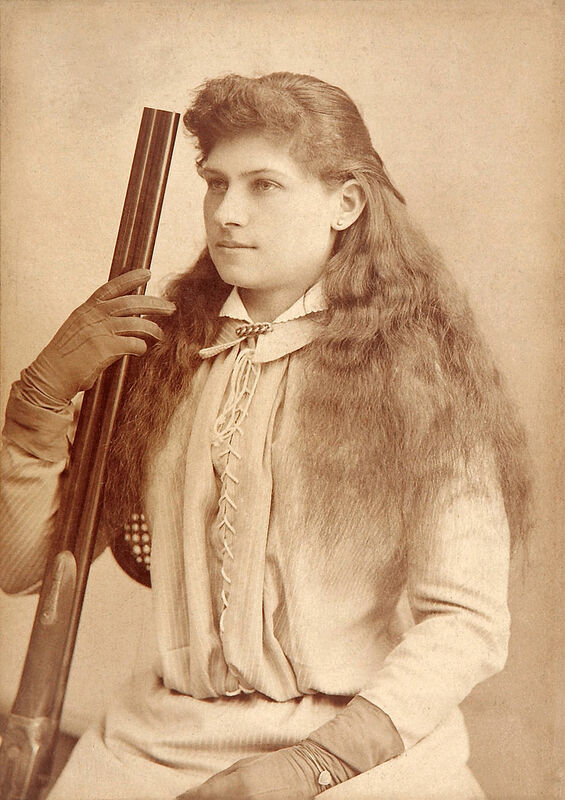 During her first engagement with the Buffalo Bill show, Oakley had a tense professional rivalry with rifle sharpshooter Lillian Smith. Smith, 11 years younger than Oakley, was 15 years old at the time she joined the show in 1886, which was probably the main reason Oakley obscured her actual age in later years. For some time Smith’s press coverage was more favorable than hers. Oakley temporarily left the Buffalo Bill show but returned two years later, after Smith departed, in time for the Paris Exposition of 1889. This three-year tour cemented Oakley’s place as a premier celebrity back in the US. She earned more than any other performer in the show, except for “Buffalo Bill” Cody himself. In Europe, she performed for Queen Victoria of the United Kingdom, King Umberto I of Italy, President Marie François Sadi Carnot of France and other crowned heads of state. Oakley is said to have shot the ashes off a cigarette/cigar held in the mouth (or hand) of the future German Kaiser Wilhelm II. Supposedly Oakley asked for volunteers as part of the act, and usually none came forward. This allowed Frank to step into the hot spot. However, in Germany the Kaiser gladly volunteered to everyone’s surprise. Endless speculation has followed. What if she had accidentally blown his head off? Would the Great War have been averted? There is also a legend that in 1916 Oakley requested a second shot. Oakley promoted the service of women in combat operations for the United States armed forces. She wrote a letter to President William McKinley on April 5, 1898, “offering the government the services of a company of 50 ‘lady sharpshooters’ who would provide their own arms and ammunition should the U.S. go to war with Spain.” The Spanish–American War did occur, but Oakley’s offer was not accepted. Theodore Roosevelt, did, however, name his volunteer cavalry the “Rough Riders” after the “Buffalo Bill’s Wild West and Congress of Rough Riders of the World” where Oakley was a major star. In 1901, Oakley was badly injured in a train accident, but she recovered after temporary paralysis and five spinal operations. She left the Buffalo Bill show and in 1902 began a quieter acting career in a stage play written especially for her, The Western Girl. 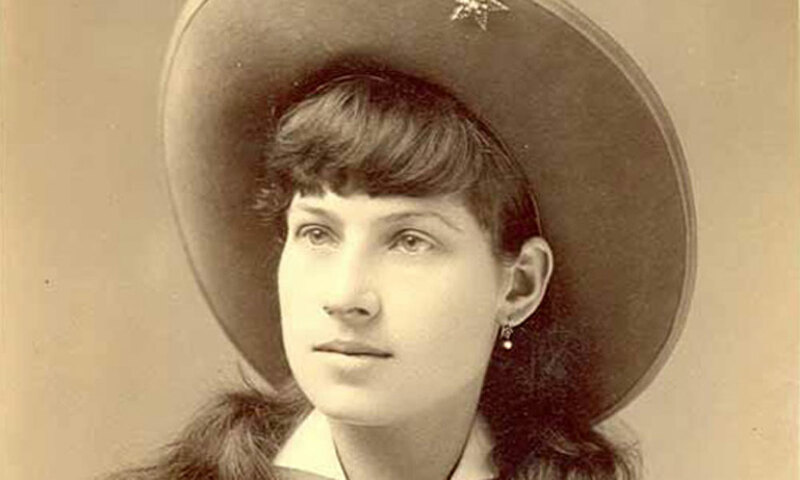 Oakley played the role of Nancy Berry and used a pistol, a rifle and rope to outsmart a group of outlaws. Her injury and change of career only added to her legend that her shooting expertise continued to increase into her 60s. 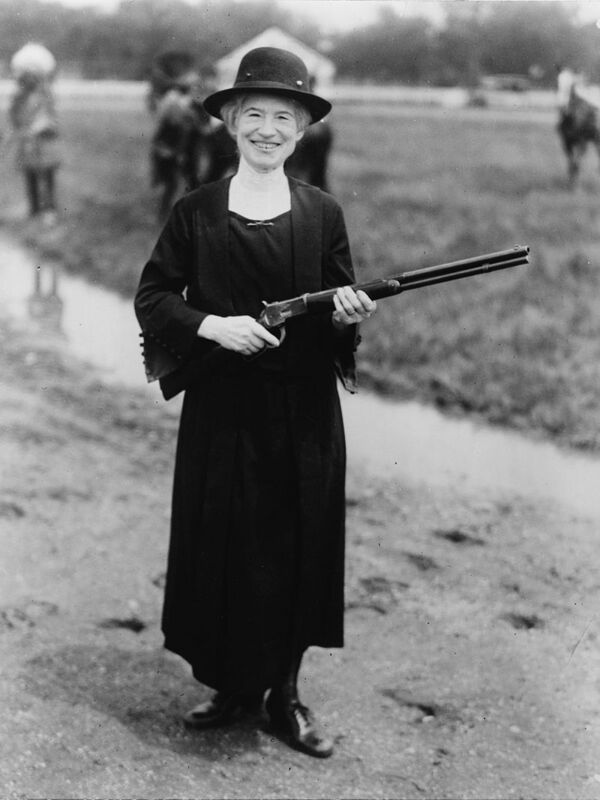 Throughout her career, it is believed that Oakley taught upwards of 15,000 women how to use a gun. Perhaps Oakley’s most famous trick was her ability to repeatedly split a playing card, edge-on, and put several more holes in it before it could touch the ground, while using a .22 caliber rifle, at 90 feet (27 m). In 1904, sensational cocaine prohibition stories were selling well. Newspaper magnate William Randolph Hearst published a false story that Oakley had been arrested for stealing to support a cocaine habit. 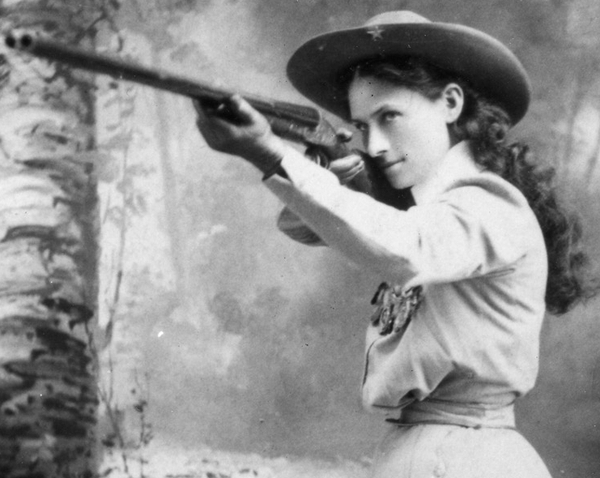 The woman actually arrested was a burlesque performer who told Chicago police that her name was Annie Oakley. Most of the newspapers that printed the story had relied on the Hearst article, and they immediately retracted it with apologies upon learning of the libelous error. Hearst, however, tried to avoid paying the anticipated court judgments of $20,000 ($533,111 in today’s dollars) by sending an investigator to Darke County, Ohio with the intent of collecting reputation-smearing gossip from Oakley’s past. The investigator found nothing. Oakley spent much of the next six years winning 54 of 55 libel lawsuits against newspapers. She collected less in judgments than the total of her legal expenses, but she felt that a restored reputation justified the loss of time and money. In 1917 Oakley and Butler moved to North Carolina and returned to public life. She continued to set records into her 60s, and she also engaged in extensive philanthropy for women’s rights and other causes, including the support of young women whom she knew. She embarked on a comeback and intended to star in a feature-length silent movie which never materialized. 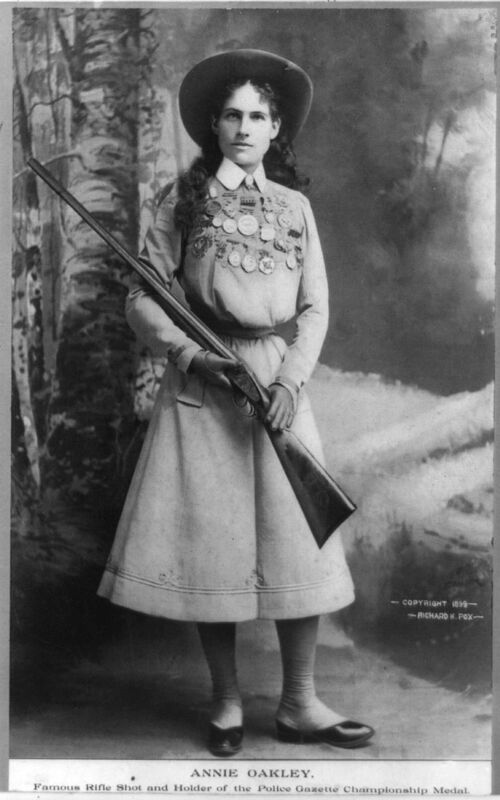 She hit 100 clay targets in a row from 16 yards (15 m) at age 62 in a 1922 shooting contest in Pinehurst, North Carolina. In late 1922, the couple were in a car accident that forced her to wear a steel brace on her right leg. She eventually performed again after more than a year of recovery, and she was still setting records in 1924. Her health declined in 1925 and she died of pernicious anemia in Greenville, Ohio at the age of 66 on November 3, 1926. Her body was cremated in Cincinnati two days later and the ashes buried at Brock Cemetery near Greenville, Ohio. Butler was so grieved by her death that he stopped eating and died 18 days later in Michigan. His body was buried next to Oakley’s ashes. After her death, her incomplete autobiography was given to stage comedian Fred Stone, and it was discovered that she had spent her entire fortune on her family and her charities. By some accounts Oakley’s favorite dish was chicken and rice, so you can make some version of arroz con pollo in celebration if you want to. 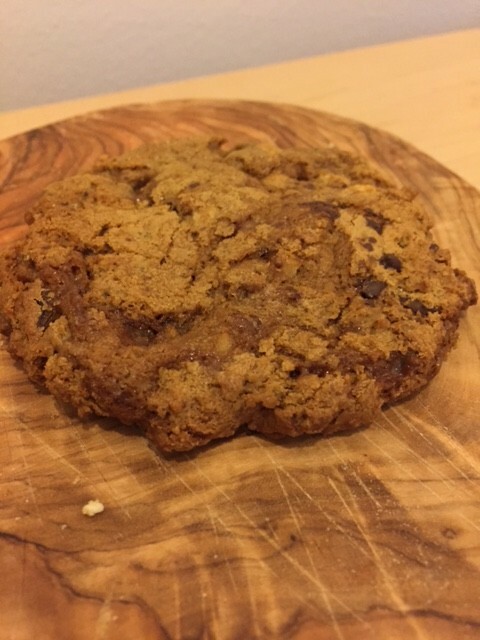 There is however a reasonably well known oatmeal cookie called Annie Oakley, so I’ll go with that. Lightly grease two baking sheets with butter. Mix all the dry ingredients in a mix bowl, then add the melted butter and eggs. Stir thoroughly to form a soft dough. Drop the dough by the tablespoon on to the baking sheets, leaving enough space between them for the cookies to expand. Bake for 15 minutes. Remove from the baking sheets with a spatula and cool on wire racks.